GROSSE LAGE UND WERT IM BRECKENRIDGE! BRECK BLEIBT EINEN EXTRA MONAT ERÖFFNET !! Lage Lage Lage !!! Dies ist das absolute beste Lage in Breckenridge. Diese Wohnanlage ist nur einen Block von der Hauptstraße und sehr nahe am River Walk Zentrum für Konzerte und Festivals! Einkaufsmöglichkeiten und Restaurants sind nur wenige Schritte von der Residenz entfernt. Der kostenlose Shuttle hält direkt vor der Wohnanlage, Sie auf der Hauptlift oder der neuen Gondelbahn ist etwa zwei Blocks entfernt zu nehmen. Sie können tatsächlich "Ski-in" auf der Four O'Clock Run, am Ende des Tages oder für ein schnelles Mittagessen!Ihr Auto können Sie buchstäblich parken in der Garage und lassen Sie es für die gesamte stay..everything ist so bequem. Die Wohnung ist attraktiv und funktionell .. Es verfügt über eine voll ausgestattete Küche mit Platz für acht. Die Wohnanlage verfügt über ein Kingsize-Bett, zwei Queensize-Betten und ein Queen-Size-Schlafsofa, um ruhig schlafen sechs bis acht. Die Anlage hat einen natürlichen Bach läuft durch die lullt Sie in der Nacht während der wärmeren Monate schlafen. Der Balkon hat sowohl die Stadt und auf die Berge. Es gibt Flachbildschirm T. V ist im Wohnzimmer und den beiden Schlafzimmern. Die Community-Whirlpools sind umgeben von Glas, und blicken auf den wunderschön gepflegten Innenhof. Die Wohnanlage hat gut beleuchteten Tiefgarage und einen Aufzug in unmittelbarer Nähe der Einheit, für einfaches Entladen nach einem langen Tag auf der Piste. Die gesamte Außenseite des Komplexes vor kurzem renoviert. Waschmaschine und Trockner in der Wohnung, Überdachte Parkhaus, Nicht rauchen oder Haustiere. Location was awesome! You could ski down the 4 oclock run to lodge every day! Loved this place! Will definitely stay here again. Unfortunately, we had to cancel our trip due to the extreme weather the Denver encountered. We could not book another flight in a timely fashion. So, this is no reflection on the condo. Just never got there. Great comfortable condo situated at the bottom of 4 o’clock run. I chose to stay at Sawmill Creek Condos because there is lots of outdoor space for the kids to play compared to the villiage. The condo furniture was comfortable and the kitchen well stocked! Since we brought our kids this year, we had groceries delivered and that was a great decision! The condo offered extra blankets and a humidifier which is a must if you are not from the area! We usually only ski, but this year we took the kids tubing and ice skating. We were planning to check out Carter park and the rec center but we ran out of time. 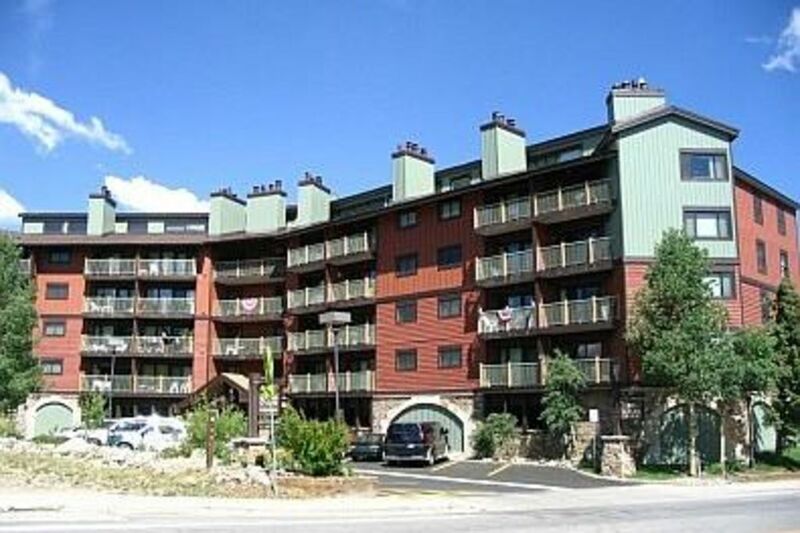 The condo is very close to restaurants and ski rentals. A shuttle service can get you anywhere else you want to go. As always, we loved visiting Breck and enjoyed our condo very much! Jodi was great to work with and you cannot beat her price in this condo unit! The condo was comfortably furnished, all of the necessities to cook-in, and "hotel quality" beds! Having an easily accessible elevator was great for hauling ski equipment. We enjoyed skiing in for lunch and at the end of the day. Jodi was great to work with and had no issues with any of the amenities provided. Would recommend! Excellent location for ski vacation! We (Family of 5: kids ages 10, 11, 13) recently returned from our second ski vacation in Breck. The location was perfect: walk out 25 yards to the bus stop (which is right in front of the condo). Less than 5 minute bus ride to either the Peak 9/Beaver Run ski lift, or less than 5-10 minute bus ride to the Gondola or the Base of Peak 8. Ski IN is down to the bottom of the green 4 O'clock run right into the condo parking lot. You really don't need a car except to drive to get groceries at the local City Mart. Lots of board games provided for family time after runs are closed. Lots of hooks for ski jackets/pants and bench in hallway to put on boots. Communication with owners was Great! Walk to downtown shopping is just 1 block away. - View from balcony is of the street. We had a power outage and I really appreciated Jodi’s prompt response to my inquiry about what to do and who to call. The living room furniture is FABULOUS! Plenty of room for 4 folks to relax after a long day of skiing. Giant TV also a plus!! The bathrooms are a little small but we all made it work. Thanks for a great stay! The damage deposit is refundable and will be returned, if the condo is left in good condition. Check-Out rules must be followed, including: disposing of all your trash, loading and running dishwasher and not leaving dirty dishes to be washed by cleaning crew. The average time required to clean the condo is two hours. Any cleaning that requires additional cleaning (dumping trash, washing dishes, etc), beyond the usual cleaning duties, will be assessed to your damage deposit. Please contact owners if you have questions about this policy.